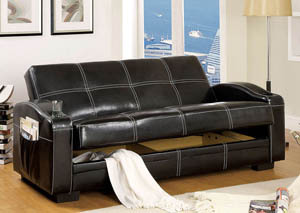 Looks like a regular sofa, but easily converts to a comfortable bed! This stylish futon sofa has built-in drink cup holders, is trimmed in white double stitching, and has handy side pockets for magazines. Underseat hidden storage is also available.